Taoufik Moalla was on his way to buy a bottle of water, happily singing along to C+C Music Factory’s 1990 song “Gonna Make You Sweat (Everybody Dance Now)” when he says he heard a police siren blaring behind him…. Moalla said police checked his licence and registration and then came back with a $149 dollar surprise: a ticket for screaming in public. According to a Montreal bylaw, “to cause disorder by screaming” violates “peace and tranquility” and can be punishable by a fine of $50 to $1,000 for a first offence…. 3. Il est défendu à toute personne, sur le territoire de la Ville, de troubler la paix et la tranquillité publiques en criant, jurant, chantant, insultant ou injuriant les gens, en se battant, organisant ou participant à un attroupement, à un spectacle brutal ou dépravé, et de refuser de cesser le trouble lorsque requise de ce faire par un agent de la paix. 3. It is forbidden for anyone in the territory of the City to disturb public peace and quiet by shouting, swearing, singing, insulting or insulting people, fighting, organizing or participating in a gathering, a brutal or depraved show, and refusing to stop the disorder when required by a peace officer. 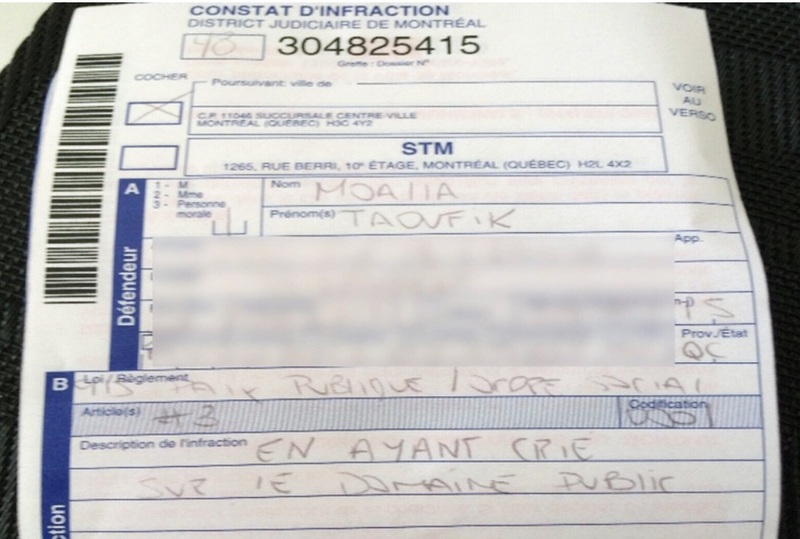 There was nothing brutal or depraved about Moalla’s singing, according to the ticket, which says he was cited for en ayant crie sur le domaine public, which Google translates as “screaming in the public domain” but is probably just “shouting in public.” In other words, it’s a noise ordinance of a kind that’s common virtually everywhere that people live within screaming distance of each other. The mystery here is why four officers thought a guy shrieking “EVERYBODY DANCE NOW” inside his own car should get a ticket for public screaming. “I don’t know if my voice was very bad and that’s why I got the ticket,” Moalla told CTV, “but I was very shocked. I understand if they are doing their job, they are allowed to check if everything’s okay, if I kidnapped someone or if there’s danger inside, but I would never expect they would give me a ticket for that.” Sure, that’d be an understandable mistake, given that ever since 1990 a surprising number of people tend to shriek “EVERYBODY DANCE NOW” if they’ve been kidnapped or are in any danger. So police kind of have to go check it out. Moalla’s wife, though, said she thought it very well could have been his voice that the officers considered a threat to public safety. “She told me, ‘if it was for singing, I’d have given you a ticket for $300,'” Moalla said. He plans to challenge the ticket, and said he would argue to the judge that vehicular screaming is too common to punish, or at least it could be. “Imagine if the Canadiens won a game,” he said. “All the fans are going to scream.” The Canadiens are currently 2-7-1, but he might not have meant it exactly that way.